Hyde Park, NY – Building on the success of its inaugural year, the second annual Menus of Change® leadership summit will delve deeper into issues at the intersection of health, the environment, and short- and long-term business strategies that will re-shape the future of the $683-billion American foodservice industry. Co-presented by The Culinary Institute of America (CIA) and Harvard School of Public Health, Department of Nutrition, the conference will take place at The Charles Hotel in Cambridge, MA on June 9–11, 2014. Registration is open to chefs, foodservice executives, research scientists, academics, policy makers, and environmental experts. Keynote speaker Michel Nischan, chef, restaurateur, and CEO of Wholesome Wave, a non-profit organization whose mission is to make locally grown produce available to people at all income levels. He will discuss his work to strengthen the collaboration between chefs, farmers, and the medical profession. Dr. Robert Lawrence, professor of environmental health sciences at Johns Hopkins Bloomberg School of Public Health, will lead us through the latest science behind concerns about excessive use of antibiotics in our meat and poultry supply. Rob Bernard, chief environmental strategist at Microsoft, will describe how company sustainability initiatives can integrate with corporate social responsibility and bottom-line imperatives. Stan Frankenthaler, a CIA graduate and vice president of global innovation and corporate executive chef for Dunkin' Brands, will share his firsthand experience with how volume foodservice operations can find more opportunities to increase focus on fruits and vegetables in menu R&D. Other subjects that will be explored include the effects of climate change on agriculture and supply chain resilience, the latest sodium research (and why last year's media reports got the story mostly wrong), and trends in consumer attitudes and behaviors around food ethics and values. A full list of session topics and speakers can be viewed at menusofchange.org. "We want attendees to leave with actionable items they can use from the first day they are back in their offices," says Greg Drescher, vice president of strategic initiatives and industry leadership at the CIA. "We'll provide a 'knowledge GPS' that includes elements such as sample menus and R&D strategies around key issues, to help participants identify next-generation business practices that are more sustainable—in all meanings of the word." The partnership between the CIA and Harvard spans more than a decade of collaboration on health and wellness research and conferences. Given that more and more Americans are relying on chefs—in restaurants, at supermarkets, and on television—for health- and sustainability-inspired daily menu suggestions, foodservice executives and entrepreneurs need clear, concise, and actionable science-based information to help their customers make food choices that meet these expectations. But due to conflicting messages in the marketplace and consumers' often inherent resistance to change, education, and collaboratively designed strategy are critical. An integral part of that education will be the 2014 Menus of Change Annual Report, which will be released on Monday, June 9 and serve as a principal reference point for discussion throughout the conference. Working with the Menus of Change Scientific and Technical Advisory Council, Dr. Walter Willett, chairman of the council and of the Department of Nutrition at Harvard School of Public Health, will present, together with other report co-authors, current, best thinking about the confluence of health and environmental evidence-based imperatives, including implications for the next three to five years and beyond. Drescher adds, "Our Menus of Change initiative will then take this science and link it to business insights that support viable, new operational concepts that first and foremost celebrate 'deliciousness'." Registration for Menus of Change 2014 is through menusofchange.org. Discussion surrounding key issues of the initiative also takes place online throughout the year, including in a monthly news update and in social media with the hashtag #CIAMOC. Scientific issues considered each year by the Menus of Change annual conference and report are informed exclusively by the project's Scientific and Technical Advisory Council, with joint oversight by Harvard School of Public Health and The Culinary Institute of America. 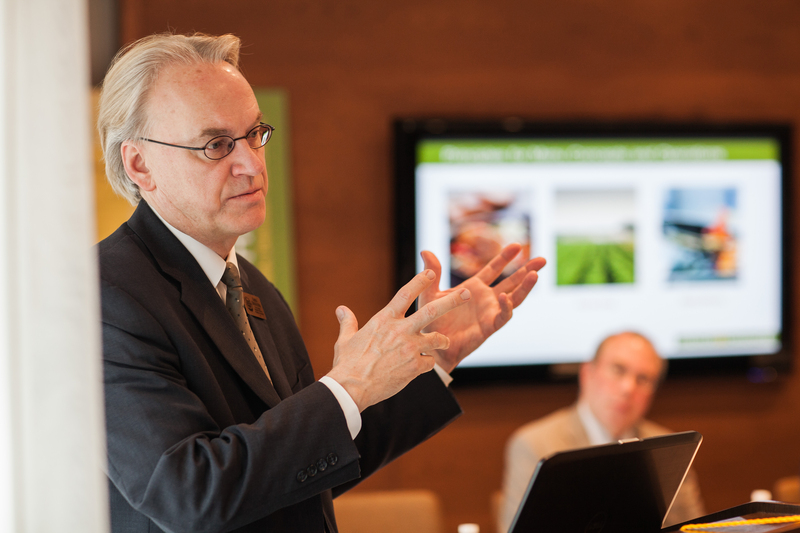 The Menus of Change Sustainable Business Leadership Council provides project insights around innovation, entrepreneurship, and changing business models. Menus of Change is made possible by a generous grant from presenting sponsor Unilever Food Solutions, a leader in sustainability. Additional support has been provided by platinum sponsor California Walnut Commission, premium gold sponsor Alaska Seafood Marketing Institute, gold sponsors Changing Tastes; Chobani, Inc.; and Paramount Citrus/Wonderful Pistachios/POM Wonderful; more than a dozen additional suppliers to the foodservice industry; and select foundations. The Culinary Institute of America, founded in 1946, is an independent, not-for-profit college offering associate and bachelor's degrees with majors in culinary arts, baking and pastry arts, and culinary science, as well as certificate programs in culinary arts and wine and beverage studies. As the world's premier culinary college, the CIA provides thought leadership in the areas of health and wellness, sustainability, and world cuisines and cultures through research and conferences. The CIA has a network of 46,000 alumni that includes industry leaders such as Grant Achatz, Anthony Bourdain, Roy Choi, Cat Cora, Dan Coudreaut, Steve Ells, Charlie Palmer, and Roy Yamaguchi. The CIA also offers programs for professionals and enthusiasts, as well as consulting services in support of innovation for the foodservice and hospitality industry. The college has campuses in Hyde Park, NY; St. Helena, CA; San Antonio, TX; and Singapore. Harvard School of Public Health brings together dedicated experts from many disciplines to educate new generations of global health leaders and produce powerful ideas that improve the lives and health of people everywhere. As a community of leading scientists, educators, and students, we work together to take innovative ideas from the laboratory to people's lives—not only making scientific breakthroughs, but also working to change individual behaviors, public policies, and health care practices. Each year, more than 400 faculty members at HSPH teach 1,000-plus full-time students from around the world and train thousands more through online and executive education courses. Founded in 1913 as the Harvard-MIT School of Health Officers, the School is recognized as America's first professional training program in public health. For more information on the School, visit www.hsph.harvard.edu.